Worldwide, acute encephalitis syndrome (AES) has been a major health problem because of associated high morbidity and mortality. AES is defined as a person of any age at any time of year with the acute onset of fever and a change in mental statuses such as confusion, disorientation, coma, or inability to talk and/or new onset of seizures (except febrile seizure). The incidence of AES varies in different studies, but the average incidence is between 3.5 and 7.4/100,000 patient-years, the incidence being higher in children. The etiology of AES can be broadly grouped under infective (bacteria and viruses) or noninfective category, which can vary widely depending on the geographical location and host factors. In most of the cases, the etiologic agent is not identified, and in diagnosed cases, viruses are the major pathogens. In India, the actual contribution of viruses to AES is not entirely known because of problems associated with laboratory diagnosis and many disorders of central nervous system (CNS) mimicking AES. Japanese encephalitis virus (JEV) vaccine has not been introduced in many regions including the eastern part of India. These factors are important for policy decision-making as well as syndromic case management where laboratory support is not available immediately. 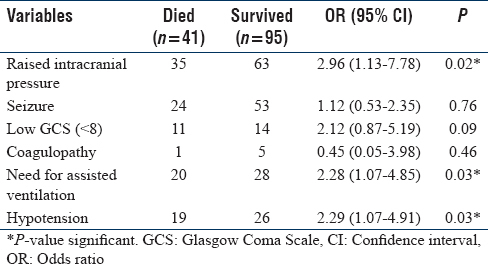 To study the clinical outcome (mortality and morbidity) of AES cases. This study was performed in the eastern Indian region enrolling AES cases admitted to SCB Medical College and SVP Post Graduate Institute of Pediatrics (SVPPGIP), Cuttack, Odisha, from July 2012 to December 2013. The SVPPGIP is a 350-bedded tertiary care pediatric teaching hospital catering to the states of the eastern part of India. For inclusion in the study, an AES case was clinically defined as a patient aged between 6 months and 15 years, at any time of year, with acute onset of fever (≥38°C) within 72 h before or after presentation, a change in mental status (including symptoms such as confusion, disorientation, coma, or inability to talk) lasting ≥24 h without an alternative cause, and/or new onset of seizures (excluding simple febrile seizures). After clinical stabilization, cases were enrolled in the study. Demographic and clinical observations were recorded in a predesigned format. The study was approved by the Institute Ethics Committee. Informed, written consent was obtained from the parents/legal guardians/caregivers before enrolment of the participants and sample collection. A standard protocol for classification was followed that included both clinical picture and laboratory findings in individual cases. Cases, positive for malaria by either peripheral smear or immunochromatography test, presenting with fever and meningeal signs confirmed to be of bacterial origin, or diagnosed with any metabolic encephalopathy were excluded from investigation for viral etiologies. Collection of samples: At the time of the initial lumbar puncture, 3 ml of additional cerebrospinal fluid (CSF) sample was obtained. This sample was divided into three parts of 1.0 ml each and was stored at −70°C until further testing. In addition, a serum sample was obtained at the same time as the initial CSF fluid collection. Early-phase samples (≤5 days of symptom onset) were subjected to polymerase chain reaction/reverse transcription (PCR/RT)–PCR and antigen detection by ELISA, whereas IgM antibodies were tested in late-phase samples (>5 days after symptom onset). The above tests were performed on blood as well as CSF samples. Detection of NS1 antigen for dengue virus was made using the ELISA kit (Panbio, Australia). IgM antibodies were detected using virus-specific ELISA kits (herpes simplex virus [HSV] from Novatech Immunodiagnostica, Germany; JE and dengue virus kits from National Institute of Virology, Pune; measles and varicella-zoster virus from De medi tech, Germany; and enterovirus from Serion Immunodiagnostica, Germany). Each test was run with known positive standards (with low and high titers), and negative controls were used to interpret a positive or negative result. Any borderline test was repeated twice before final interpretation. Viral nucleic acid was extracted from 200 μl of specimen using either the DNA extraction kit or viral RNA kit (Qiagen, Germany). Either 80 μl DNA or 40 μl RNA was eluted at the end of the extraction procedure. Nucleic acid was either processed immediately for PCR amplification or stored at −80°C for further use. Conventional PCR or RT-PCR was conducted depending on the virus suspected to cause the syndrome.,,,, Testing for scrub typhus (IgM) and Leptospira (ELISA) was done in selected cases only where the index of suspicion was high. Neuroimaging (magnetic resonance imaging/computed tomography [MRI/CT]) was done in patients with persistent neurological deficits/problems. Descriptive statistical methods were used to present the demographic characteristics. Data were analyzed by the use of statistical software (SPSS version 20, IBM, Armonk, NY, USA). Chi-square test and Fisher's exact test were performed to test for differences in proportions of categorical variables between two or more groups. Student's t-test was performed to compare the mean between two groups. The level of P < 0.05 is considered significant. HSV-I or II IgM-positive and HSV PCR-positive samples were grouped as HSV infection for analysis because PCR-positive samples could not be classified further. Of 834 of clinically suspected AES cases, viral etiology could be confirmed in 136 (16.3%) cases. Other causes included pyogenic (n = 112), cerebral malaria (n = 109), tubercular (n = 98), acute disseminated encephalomyelitis (n = 6), and unknown (being the majority). Testing for scrub typhus and Leptospira was negative where indicated. The median age of the patients in viral AES group was 6 years and in nonviral AES was 5 years. The age group of 5–15 years was significantly affected in viral AES cases (P = 0.02). Males were commonly affected than females in both the groups. Neither the socio-economic status (lower, middle, and upper) nor the living condition (rural or urban) was significantly different between the two groups. There was no difference in the nutritional status of children between the two groups. Majority of the viral AES cases (61%) were enrolled during July to October (during both part of the study period), corresponding to the postmonsoon and early winter in Eastern India. Last 4 months of the year 2013 had the highest admission, with September showing the maximum cases of HSV-I infection. December and January 2012 and December 2013 had no cases of HSV-I infection. [Table 1] shows the clinical characteristics of all the AES cases at presentation. Majority of the cases presented with fever, altered sensorium, raised intracranial pressure (ICP), seizure, and vomiting. The presence of raised ICP, low GCS (<8), rash, motor paralysis, and cranial nerve palsy was noted to be significantly higher in the viral AES group. Of 76 cases diagnosed with possible HSV encephalitis, 9 (11.8%) presented with vesicular rash. These patients responded well to intravenous (iv) acyclovir therapy. Of these 9 patients, 2 children developed it 2 months before presenting with features of neurologic involvement, signifying reactivation of latent infection. In 15 measles cases, only 1 had rash at presentation, and all were >1-year age. Rest 14 cases presented variably between 5 and 8 days of measles onset with clearance of the rash. [Table 2] shows the clinical characteristics of all the AES cases at presentation. Majority of the cases presented with fever, altered sensorium, raised ICP, seizure, and vomiting. The presence of raised ICP, low GCS (<8), rash, motor paralysis, and cranial nerve palsy was noted to be significantly higher in the viral AES group. Of 76 cases diagnosed with possible HSV encephalitis, 9 (11.8%) presented with vesicular rash. These patients responded well to iv acyclovir therapy. Of these 9 patients, 2 children developed it 2 months before presenting with features of neurologic involvement, signifying reactivation of latent infection. In 15 measles cases, only 1 had rash at presentation, and all were >1-year age. Rest 14 cases presented variably between 5 and 8 days of measles onset with clearance of the rash. All the cases at admission underwent evaluation for raised ICP clinically and by fundus examination for papilledema. Neuroimaging was done in unequivocal cases or in cases requiring further evaluation. Raised ICP was primarily managed by injection mannitol, 3% saline infusion, head end elevation, and keeping pCO2 in lower normal range. The hospital protocol is to start empirical iv broad-spectrum antibiotics (ceftriaxone and/or vancomycin and/or meropenem) plus iv acyclovir and antimalarial (iv artesunate) in all cases presenting with AES after sending appropriate investigations. All the cases were managed as per this protocol. Appropriate supportive management was provided in all the cases. [Table 3] shows the complications developed during hospital stay. Need for assisted ventilation, development of hypotension requiring vaso-pressure support, and mortality were significantly higher in the viral AES compared to the nonviral AES group. The mean hospital stay in patients with viral encephalitis was 13.4 days, while that of nonviral AES was 11.6 days. There was no significant difference in the hospital stay of 14 days in both the groups. Mortality (case fatality rate) was 30.12% in cases in viral AES, while in cases of nonviral AES, it was 12.6%. [Table 4] shows laboratory parameters in cases of AES. There was no significant difference in the mean levels of laboratory parameters among viral and nonviral AES cases. This means that routine laboratory parameters are not helpful in supporting a particular diagnosis of AES case. [Table 5] shows the definitive diagnostic tests in viral encephalitis. HSV was the most common cause: 76 possible cases (HSV-I most common) and 28 definite cases (PCR confirmed) of HSV encephalitis. In 24 cases, coinfection was identified. The neuroimaging features of viral AES cases were as follows: In HSV-I infection, most patients had high-intensity lesion in temporal lobe on T2-weighted MRI of the brain, and rest had high-intensity lesion on both temporal and frontoparietal areas and rarely on limbic area or globally. In HSV-II infection, global involvement was more common over temporal lobe involvement. In JEV infection, involvement of limbic area was more common than global cerebral involvement. In varicella-zoster virus (VZV) infection, only global involvement was there. Of 834 patients with AES, 136 were having viral and the rest 698 were having nonviral etiology. The presence of low GCS (<8), rash, motor paralysis, and cranial nerve palsy was noted to be significantly higher in the viral AES compared to the nonviral AES group. Need for assisted ventilation, development of hypotension requiring vaso-pressure support, and mortality were significantly higher in the viral AES compared to the nonviral AES group. Mortality (case fatality rate) was 30.14% in cases in viral AES, while in cases of nonviral AES, it was 12.6%. The result of the present study is mostly in accordance with that of previous studies describing both epidemic and sporadic AES cases in different parts of the world.,,,,, It is known that the etiological diagnosis of AES cases represents a diagnostic challenge. In a previous large series of 1500 patients from the USA, only 16% had a confirmed etiology (viruses contributed to the majority). In another study from Canada, etiology could not be established for >55.2% of patients with viruses identified in 27% cases. Similarly, etiology was not found in >50% cases in the present study with viruses being the most common etiology. This may be because of some difficulty in isolation of the organism, delayed presentation of the cases to a tertiary health-care facility, prior antiviral use (particularly in herpes virus cases), autoimmune phenomenon leading to encephalitis, and no investigation of outbreak cases separately. Although viruses are the major cause of AES, the type of viruses also markedly differs in different parts of the world. For example, HSV is a most common viral agent for AES in China, the UK, Norway, Spain, and France.,,,, JEV is the predominant cause of AES from North and Northeast India and Cambodia.,, Although enteroviruses are being increasingly recognized as an important pathogen for AES cases, no case caused by any enterovirus was identified in the present study. This could be because of fragility of these viruses or inadequate diagnostic modality employed. Similar to previous studies, mumps, VZV, and measles were rarely reported in the present study as the causes of AES; however, these have been identified as emerging viruses that can cause AES outbreaks both inside and outside Indian subcontinent. Dengue virus infection was found in 6 (3.4%) patients with viral AES in the present study, who were referred during a dengue outbreak encountered in the region. These patients had thrombocytopenia along with CNS involvement. One of them died, even in the absence of hemorrhagic manifestations. Although precise pathogenesis of dengue-associated CNS manifestations remains unclear, this report adds to the potential of dengue infection for encephalitis that is being reported with increasing frequency in endemic areas.,, Three (2.2%) cases of VZV encephalitis were identified. These patients recovered from exanthematous illness but developed encephalitis within 2 weeks. Neurological complications (cerebellar ataxia and encephalitis) by VZV have been observed previously., This emphasizes the fact of placing children under follow-up who have recovered from varicella. Of 15 measles cases in this study, only 1 had rash at presentation, and all were >1-year age. Rest 14 cases presented variably between 5 and 8 days of measles onset with clearance of the rash. All the 11 JEV-AES cases were isolated cases without clustering, and all were reported during the postmonsoon period. Certain epidemiological factors such as presence of paddy fields, postmonsoon period, and low socioeconomic status are shown to promote transmission of JEV. Studies have shown that in acute febrile encephalopathy or AES, the mortality is higher in viral cases. This could be because of nonspecific manifestations leading to delayed presentation, no specific treatment for viruses, fulminant course with some viruses, difficulty in establishing diagnosis early leading to delayed treatment, and common occurrence of complications (shock, respiratory failure, and bleeding). Previous studies from India have reported a mortality rate varying from 15% to 40%., The present study finding is in accordance with them. Minor difference could be due to underlying virus, timing of presentation, and demography of the study population. Viral etiology forms a significant proportion of pediatric AES. Morbidity and mortality are high in viral compared to nonviral AES. Herpes encephalitis (HSV-I) is the most common cause of pediatric AES in Eastern India. Viral AES has poor prognosis compared to nonviral AES. Global cerebral injury is common in HSV, JE, and varicella-virus AES. Sharma S, Mishra D, Aneja S, Kumar R, Jain A, Vashishtha VM, et al. Consensus guidelines on evaluation and management of suspected acute viral encephalitis in children in India. Indian Pediatr 2012;49:897-910. Granerod J, Crowcroft NS. The epidemiology of acute encephalitis. Neuropsychol Rehabil 2007;17:406-28. Rathore SK, Dwibedi B, Kar SK, Dixit S, Sabat J, Panda M. Viral aetiology and clinico-epidemiological features of acute encephalitis syndrome in Eastern India. Epidemiol Infect 2014;142:2514-21. Markoulatos P, Georgopoulou A, Siafakas N, Plakokefalos E, Tzanakaki G, Kourea-Kremastinou J. Laboratory diagnosis of common herpesvirus infections of the central nervous system by a multiplex PCR assay. J Clin Microbiol 2001;39:4426-32. Lanciotti RS, Calisher CH, Gubler DJ, Chang GJ, Vorndam AV. Rapid detection and typing of dengue viruses from clinical samples by using reverse transcriptase-polymerase chain reaction. J Clin Microbiol 1992;30:545-51. Pujhari SK, Prabhakar S, Ratho RK, Modi M, Sharma M, Mishra B. A novel mutation (S227T) in domain II of the envelope gene of Japanese encephalitis virus circulating in North India. Epidemiol Infect 2011;139:849-56. Kremer JR, Fack F, Olinger CM, Mulders MN, Muller CP. Measles virus genotyping by nucleotide-specific multiplex PCR. J Clin Microbiol 2004;42:3017-22. Egger D, Pasamontes L, Ostermayer M, Bienz K. Reverse transcription multiplex PCR for differentiation between polio- and enteroviruses from clinical and environmental samples. J Clin Microbiol 1995;33:1442-7. Xie Y, Tan Y, Chongsuvivatwong V, Wu X, Bi F, Hadler SC, et al. Apopulation-based acute meningitis and encephalitis syndromes surveillance in Guangxi, China, May 2007-June 2012. PLoS One 2015;10:e0144366. Olsen SJ, Campbell AP, Supawat K, Liamsuwan S, Chotpitayasunondh T, Laptikulthum S, et al. Infectious causes of encephalitis and meningoencephalitis in Thailand, 2003-2005. Emerg Infect Dis 2015;21:280-9. Bokade C, Gulhane R, Bagul A, Thakre S. Acute febrile encephalopathy in children and predictors of mortality. J Clin Diagn Res 2014;8:PC09-11. Glaser CA, Honarmand S, Anderson LJ, Schnurr DP, Forghani B, Cossen CK, et al. Beyond viruses: Clinical profiles and etiologies associated with encephalitis. Clin Infect Dis 2006;43:1565-77. Jain P, Jain A, Kumar A, Prakash S, Khan DN, Singh KP, et al. Epidemiology and etiology of acute encephalitis syndrome in North India. Jpn J Infect Dis 2014;67:197-203. Granerod J, Ambrose HE, Davies NW, Clewley JP, Walsh AL, Morgan D, et al. Causes of encephalitis and differences in their clinical presentations in England: A multicentre, population-based prospective study. Lancet Infect Dis 2010;10:835-44. Mailles A, Stahl JP; Steering Committee and Investigators Group. Infectious encephalitis in France in 2007: A national prospective study. Clin Infect Dis 2009;49:1838-47.
de Ory F, Avellón A, Echevarría JE, Sánchez-Seco MP, Trallero G, Cabrerizo M, et al. Viral infections of the central nervous system in Spain: A prospective study. J Med Virol 2013;85:554-62. Bernard S, Mailles A, Stahl JP; Steering Committee and Investigators Group. Epidemiology of infectious encephalitis, differences between a prospective study and hospital discharge data. Epidemiol Infect 2013;141:2256-68. Kakoti G, Dutta P, Ram Das B, Borah J, Mahanta J. Clinical profile and outcome of Japanese encephalitis in children admitted with acute encephalitis syndrome. Biomed Res Int 2013;2013:152656. Srey VH, Sadones H, Ong S, Mam M, Yim C, Sor S, et al. Etiology of encephalitis syndrome among hospitalized children and adults in Takeo, Cambodia, 1999-2000. Am J Trop Med Hyg 2002;66:200-7. Puccioni-Sohler M, Rosadas C. Advances and new insights in the neuropathogenesis of dengue infection. Arq Neuropsiquiatr 2015;73:698-703. Aggarwal A, Kumar P, Faridi MM. Neurological manifestation as presenting feature of dengue infection. J Pediatr Neurosci 2015;10:76-7. Misra UK, Kalita J, Mani VE, Chauhan PS, Kumar P. Central nervous system and muscle involvement in dengue patients: A study from a tertiary care center. J Clin Virol 2015;72:146-51. Weeratunga PN, Caldera MC, Gooneratne IK, Gamage R, Perera P. Neurological manifestations of dengue: A cross sectional study. Travel Med Infect Dis 2014;12:189-93. Bozzola E, Tozzi AE, Bozzola M, Krzysztofiak A, Valentini D, Grandin A, et al. Neurological complications of varicella in childhood: Case series and a systematic review of the literature. Vaccine 2012;30:5785-90. Gowin E, Wysocki J, Michalak M. Don't forget how severe varicella can be – Complications of varicella in children in a defined Polish population. Int J Infect Dis 2013;17:e485-9.